I have long advocated for breaking down the walls in instruction. We can do this both within the classroom and outside. This post is about something a bit different. This is about what it really means to be an educator, and more. It has been months since I last posted. I did some writing as I worked on another, somewhat related, project at the start of the summer. Then, I stopped. I just stopped. I could feel something shifting and, to be honest, I got shoved way out of my comfort zone a couple of times. And then, magic started happening. As summer came to a close and we entered the full swing of the school year, the shift continued. I jumped back into Twitter chats that I have missed for months, close to a year in some cases. I continued with the necessary shift taking place and my classroom and my students are better for it. I am better for it. Still, it was reconnecting with my PLN that really made a difference I could feel and experience in a more immediate way. When your bucket fills on a Monday night as you connect with TOSA Chat or your heart grows exponentially on a Thursday night with the DitchBook Chat, it just feels good. The more long-term changes resulting from the shift that started over the summer started giving me more tangible results as the first trimester went on. In the meantime, the short-term bucket fills and heart growth helped make the long-term things come to life as well. So, for the first time in nearly six months, here I sit, reflecting. I planned to write about FallCUE a couple of weeks ago. As you can see, that has yet to happen. It, too, has been shifted. Let's take a look at what being an educator really means. We pour so much of ourselves into our classrooms and our students and our lessons. Someone recently said to me, "it takes a real passion to do what you do. Teachers have to be passionate people." If you ask a middle school teacher to describe kindergarten teachers, they will quickly say that kindergarten teachers are very special people who do extraordinary things. "I could never do it," will declare the middle school teacher. Then turn around and ask kindergarten teachers to describe middle school teachers. You will hear the same thing. "I could never do it," will declare the kindergarten teacher. That says a lot right there. All teachers are special. All teachers are capable of doing extraordinary things. The patience demonstrated by the kindergarten teacher is quite similar to that of the middle school teacher, but the ages of the students are different and how that patience is practiced will vary. I am incredibly thankful for my extended PLN. In my PLN, I have chance to connect with teachers across all grade levels, as well as TOSAs, administrators, and support staffers. I have worked in everything from SDC and resource in public schools to as a TOSA at a K-8 private school to in both small and large middle school classrooms. As such, I feel myself constantly wanting to learn more and be more and do more. My extended PLN allows me to do that. I have grown as a math and science teacher, especially, over the years. I thank my professional development opportunities for that. It is about what we do outside of the classroom as much as what we do in the classroom. Who we connect with and how we learn and the extras we do will make long-term, meaningful impacts. While we may not see the ultimate impacts of the choices we make now, they will happen. And that is what has me reflecting tonight. 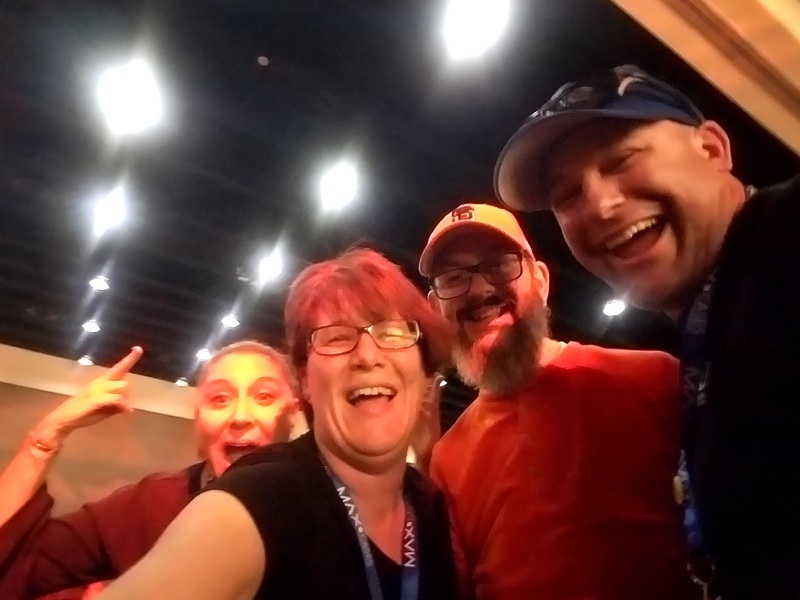 When I attended my second Spring CUE conference, I ventured out for the karaoke meetup. I had considered it the year before, but skipped it. This year, I was determined to go. 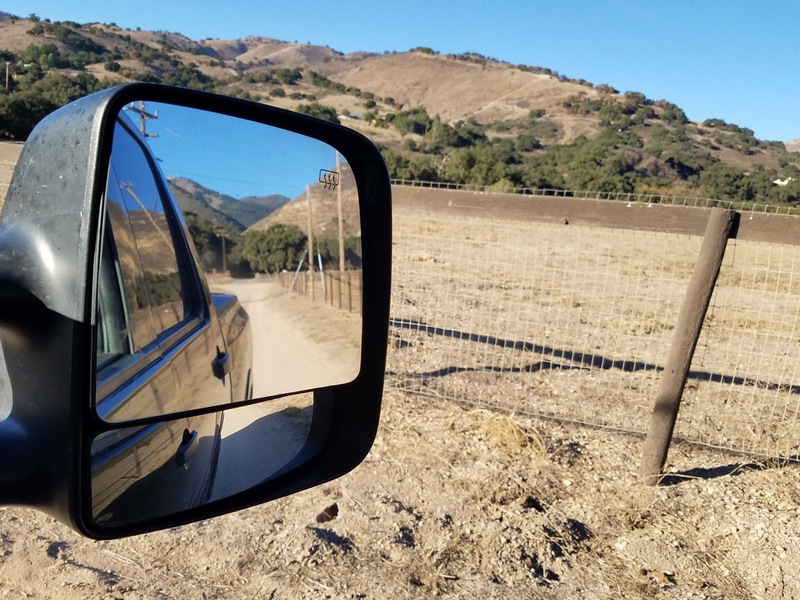 When I attend Spring CUE, I have traveled by myself, I have stayed by myself, and I pretty much have paid my own way for every bit of it in one way or another. So, there was this CUE Karaoke thing happening in what was essentially a section of a hallway in the Renaissance Hotel. It was y second time attending the conference, so I knew faces better and I had started to connect with people on Twitter more. Still, I didn't REALLY know anyone. I texted back in forth with my best friend as I worked to select a song to sing. I don't sing well, but I love karaoke. I picked "Friends in Low Places." As I sang, I got more and more nervous, in part, because hardly anyone in the small crowd joined in with me. But, I did it. I took a risk. I did what we tell our students to do every day. Take a risk. The only failure is in not trying. Right? It sounds silly that it started with karaoke, but I was able to take things to the next level. I submitted a proposal to CapCUE's TechFest and presented there the following September. The following February, I was presenting at ETC! the education event put on by SCOE at Stan State. 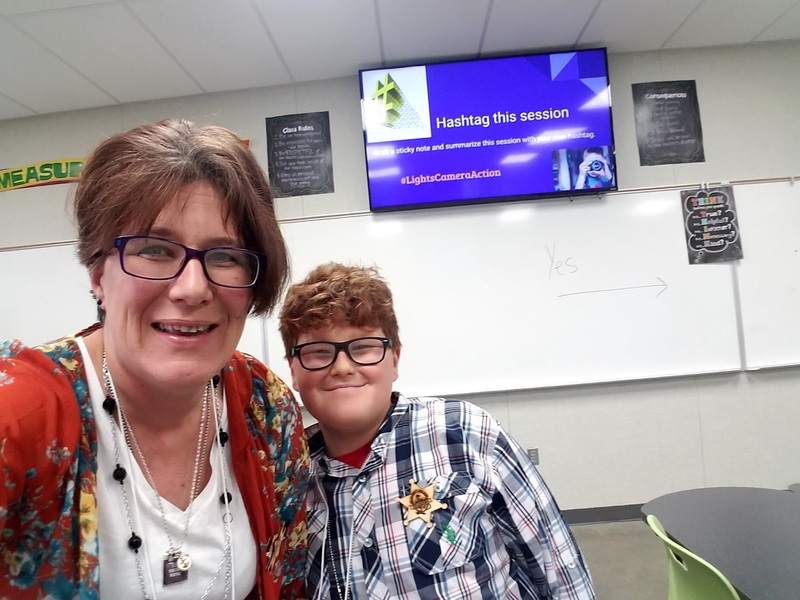 Less than a month later, I was back at Spring CUE and I ventured out for dinner by myself where I ended up eating dinner with a few educators from Bakersfield then we headed over to CUE Karaoke. I picked Janis Joplin's "Me and Bobby McGee." I had no expectation of anyone singing along, but I was comfortable enough with myself and the song and life in general that I didn't care. And then, it happened. People sang with me. It was super rad, great fun! It all started with a risk. Getting to know our students is imperative. Connecting with them provides us insight into how they think, what motivates them, and how we can better serve them. Finding out what kind of music a student likes can provide a wealth of knowledge about that student. Just the same about other interests such as sports, other extracurricular interests, friends, and such. I used to tell students, "I don't care if you like me. I do demand that you respect me." What I have come to realize over the years that what they likely heard was "I don't care" and everything after that was lost. And, the fact of the matter is, it is important to me as an educator to make connections and know my students. The person who recently said that educators are passionate about what they do is absolutely correct. We have to be passionate about what we do and who we serve. If I see a student is struggling to accomplish a given task, I will take the time to ask how we can tackle the issue. When a student is ready to give up on a math problem, I will turn their question around and have them explain it to me. When a student feels lost, I will do everything I can to lead them and then teach them how to lead. But it goes beyond that. I have attended water polo scrimmages, football games, confirmations, graduation parties, and stage performances for past and current students. I have seen faces light up because I was present for something that was important to them. 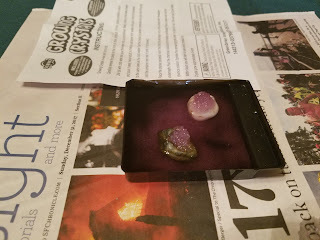 I also use "optional field trips" on weekends or holidays to connect with students and their families. We meet for hikes or movies, but this year I am branching out some. We're doing a bigger hike, farther from home, and in December, a few of us are going to see A Christmas Carol in San Francisco. I am also looking at visiting the USS Hornet later in the year. There are many wonderful opportunities in the world to expand our learning. And I will continue to do those things as long as I possibly can, no matter how old they get, no matter how old I get. Educators have to be in the business of kids. I know that. Still, it amazes and impresses me when someone does something super special for a kid, especially my kid. My kids and I do a podcast that we record irregularly, but are passionate about doing. We call ourselves the EdTech Family. We share this with anyone and everyone who will listen. It is a special thing for us. We also listen to education podcasts together. Well, one at least. (I listen to most others on my own.) The Check This Out Podcast has fascinated Connor for about three years and now that we spend more time in the car together on weekdays, both kids are hooked. Recently, Connor found their website and went on to record a message for Ryan and Brian. These two amazing educators took his recording and played it then talked about it in what ended up being about a two-minute segment on their recent episode. As we listened, Connor lit up. I teared up. The entire thing was completely beautiful, and appreciated beyond words. Side note: Ryan is one of the people who led the charge for singing along with me at that karaoke a few years ago. So, let me wrap this all up together. Educators are special people. They go the extra mile. When that extends beyond the classroom, magic happens. When you get shoved outside of your comfort zone and there is someone there saying, "it's all good...ready, set, go..." Magic happens. The things we do for each other as educators makes a world of difference. The things we do for our students outside of the classroom makes a world of difference. The things we do for kids whether they are our students or not, makes a world of difference. 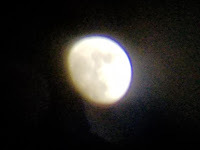 Keep writing, keep recording, keep connecting, keep shining, keep existing, keep being in the business of people, of kids, of learning. Be passionate. We educators can be, should be, and are some of the most passionate people on this beautiful planet. And to my educator friends, I thank you for all you are and all you do. I also want to remind you that every little thing you do matters and you are constantly making a difference. If you feel pushed out of your comfort zone and you're wondering where the magic is, I assure you, it is coming. Magic is happening and the lasting impact of everything you do may not be immediately evident, but you are making lasting impacts. There are people who appreciate what you are doing. Again, I thank you. In November 2016, I wrote abut being the guide for my students. I wrote that I hoped for the best for my students and that they are why I do what I do. I shared that even my own children know this. Today, as my children and I loaded into the car, I was buckling in my seven-year-old as I said, "my kids have pictures first thing this morning." She looked at me and said, "you're talking about our students, right?" "Yes," I replied. She knew. She and her brother have been students at the school where I teach since the start of this school year. She knows that they are my children and she knows that I consider my students "my kids." You are more than a body in a classroom. You are more than a test score. You are one of my kids. I will look out or you. I will help you. I will guide you. My goal is not to set you up for failure, but to help you succeed. Let me guide you to success. When I see something isn't working right, I adjust. If a timeline is too tight, I will look at it and, if necessary, change the deadline. If you need the materials to complete a task, I will make sure you have them. If you are frustrated because a costume isn't quite right, I will find you something that works. If you are cold, I will find a jacket for you. If you are hungry, I will feed you. My students will not fail because I will not fail them. I will not fail them because they are my kids. I am imperfect. I know this. I embrace this, in fact, each and every time I admit that I am perfect in my imperfections. However, I will always do everything I can to help a student on the road to success. I hope they know that. And, I hope they will take me up on my offer. You need ingredients for the latest Kitchen Chemistry assignment? Tell me, Write me a list. I will provide what you need. You are cold and can't find your jacket? Here's a sweatshirt. You are hungry and don't have a snack today? Please, grab a cheese stick from the fridge. You are working on a video and the app isn't working? Let's find a solution. Your file won't upload? Let's look at it together? You need a charger? Here, I don't use Apple products, but I bought this for you to use. I am not setting you up for failure. I will set you up for success. But, you do have to do your part. You have to ask. You have to be willing to accept help. You have to take your own steps. I can't walk the walk for you, but I will walk it with you. I am preparing to send a graduation card to a student I had several years ago. He didn't need any of these guiding parts of what I do, but he appreciated every step I walked with him and he keeps in contact. I made items available to former students so they could complete high school projects. I will continue to do this and whatever else it takes to help students meet the successes they deserve. Their learning. Their achieving. Their success. I love watching them bask in their own greatness. No material thing should ever stand in the way of a student's success. I will invest in every single one of my kids just as I would invest in my own children. Why? Because I am a teacher. I am an educator. I care. I love deeply. I guide. And, I am not alone. There are so many like me. You are more than our students, you are our kids. I am thankful for the educators I know who live by this. You are our tomorrow. Let us help you through today. I arrived at the Ontario Airport yesterday afternoon and grabbed my rental car so I could get myself to Palm Springs. I arrived earlier than hotel check-in, but they happily accommodated me and got me into my room. Everything has been smooth so far and for that, I am thankful. I am thankful to once again have the opportunity to attend the Spring CUE Conference. Every year has provided a different experience for me and I knew coming into this year that this would be a unique experience in itself, and it is far more than the fact that the weather is cool and drizzly (though now the rain seems to have finished and moved on). I very nearly decided to skip CUE this year. I've started looking at ways to reorganize my schedule and maximize my time. I want to be selective about when and where I go for PD while making sure that I am bringing back the best of everything I can for my students. If you've read my posts before, you know that I firmly believe that in making myself my best me, I will make my students their best selves as well. I love this conference, and I think I was looking for a "reason" to attend, a "sign," if you will. And then, the signs started popping up and I knew I had to be here. Matt Miller speaking at the opening keynote made me want to make the trip. 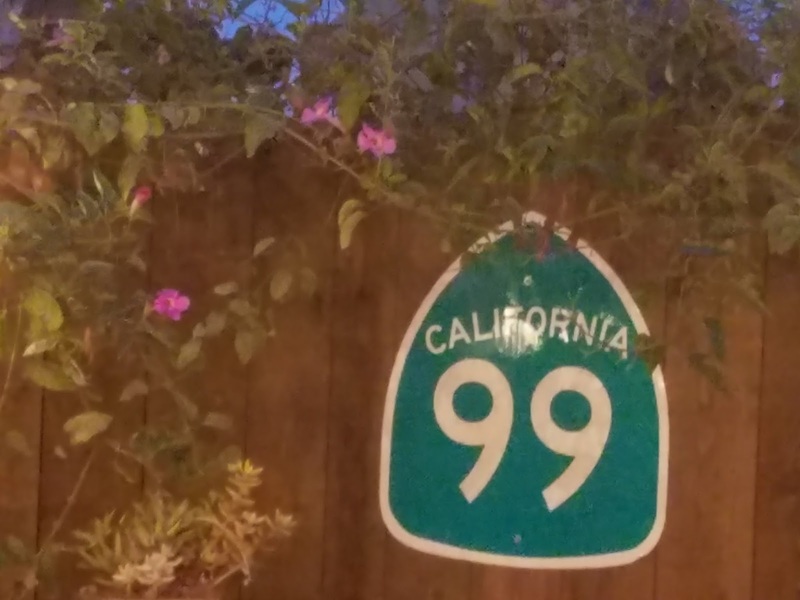 Becoming part of the Central California CUE Board gave me a sense of obligation. I had made my hotel reservations last summer, so I was in good shape there. Then, I secured my slot, made my reservation for the conference. In the meantime, my class and I submitted a project idea for the 2018 Leroy Finkel Fellowship AKA Leroy's Big Idea. In February, I received notification that my idea had been selected as a finalist and now, I NEEDED to be in Palm Springs. And so, here I am. I feel more connected this year than in previous years. The first year I attended, I came by myself. I ate by myself, I wandered the exhibition hall by myself. I slowly started talking to people, but for the most part, I was a loner. At the end of the conference, a friend met me and we spent the final evening celebrating my birthday before I returned home the next day. By the following year, I knew a few folks, but still traveled alone with the exception of my friend making part of the trip with me. We got an AirBNB and grocery shopped and settled in for the weekend. When she suddenly left after the first night, I was on my own. We did celebrate my birthday before her departure, but I spent most of the conference solo. 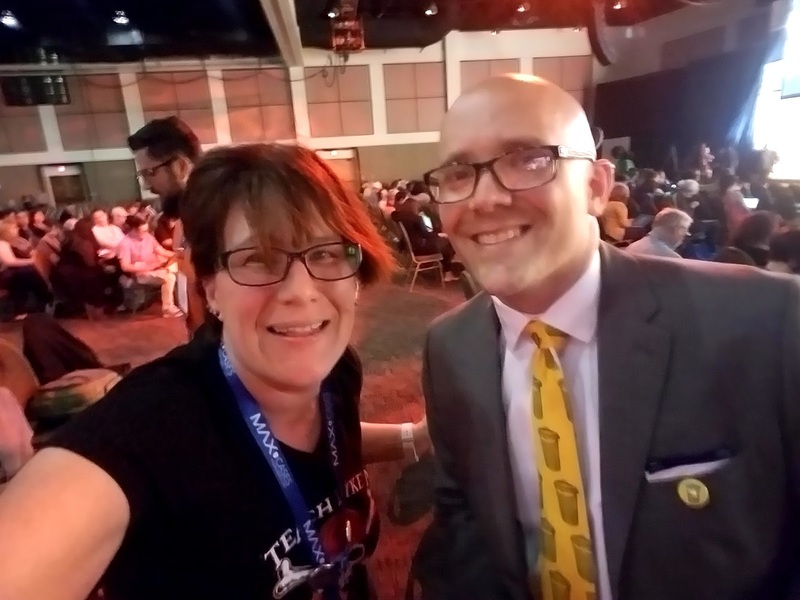 Each year, though, I have made more contacts and worked on connecting myself with other educators from whom I can learn, but also with whom I can share. This year, I feel more myself than before. I spend time with people and take a few moments to myself. Did I mention, I love this conference and love my CUE PLN? This year, CUE turns 40. It seems pretty groovy to be 40 and helping CUE celebrate its 40th anniversary. 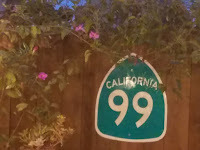 Of course, upon my return home, I will cruise over the line to 41. Over the past few years, I have connected with more people. I have attended local education events and participated in education Twitter chats. Coming to CUE alone, yet feeling connected is such an awesome feeling. Dare I say, "eduawesome." It is here in Palm Springs that those relationships are nurtured and then allowed to continue to grow in other areas throughout the rest of the year. Now being a member of our local affiliate board has given me new insight to the importance of these edu-friendships. This year, I reached out to more people ahead of the conference and worked to make sure that I would connect with people once here. I am thankful I did that. My participation in the DitchBook chat (Thursday nights at 7 p.m Pacific Time) was a large part of my WHY for this year. Getting to meet Matt Miller could be seen as a "fangirl" moment, but what I realized was that I was excited to meet him for some of the same reasons I am excited to meet anyone from my PLN with whom I had not previously connected. Having these face-to-face moments with people I have collaborated with is important to me because the things we discuss, the ideas we share, and the benefit to our students are all very important matters. For the second year, CUE is running a game where you can earn badges. Last year, I felt highly competitive and sought to WIN the game. This year, it was more about earning the badges and moving forward, connecting with people, and enjoying the conference on the whole. Let me tell you, I am not alone in enjoying gathering stickers and actually earning badges takes it to the next level. I have started digital badging in my class this year. I look forward to expanding my use of digital badges and hope to one day have stickers to go along with them. I started working on my CUE game accomplishments before I even got on the plane to come to the conference, as did others. I wrapped up a few accomplishments today and it felt good. Setting aside the competitiveness and focusing on a more well-rounded experience felt even better. I also got nurture relationships that were established last year, in part, because of this game. If you haven't started the game yet, it's not too late. Give it a try. You may find some fun in it as well. 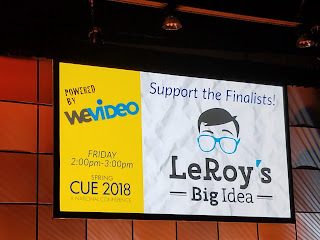 The second 24 hours at CUE will take me into my Leroy Finkel Fellowship presentation. I have invited as many people as I can to come check out all of the finalists and I have shared on social media. I think it will be a great afternoon and look forward to sharing it with some of my favorite people, other educators who, like me, have big ideas. If you have never before presented, you may be unaware of what happens with the feedback you submit. That feedback goes to the organizers of the event, but it also goes on to the presenters. As a presenter, I assure you, I read the feedback I receive. In fact, I count on it. As I present, I am constantly looking at how certain aspects go and making mental notes. Once I have completed my presentation, I make notes on things I want to change. Many things can factor into this: reaction to certain pieces, flow of the presentation, questions asked, how different topics develop organically, and how I feel about the information I have presented. Then, once I receive feedback passed on to me from the organizers, I incorporate that into how I make adjustments to my presentations. I never have presented the same thing exactly the same as the time before because I update my presentations each time. As a presenter, I rely on your feedback. Other presenters do as well. What I am sharing with you here, I share on behalf of presenters everywhere who have had similar experiences. When you submit your feedback following a session, the words you say can be incredibly helpful. I welcome constructive criticism. I need it in order to be better. I want to improve. I want the things I present to you to be the best I can make them. If something works, I need to know, just as I need to know if something doesn't work. I welcome any supporting statements to your reactions that you may offer. Please tell me why something just did or didn't work for you. That will help immensely. On the other side of this coin, though, I have found hurtful comments that do nothing to help me improve the information I bring to you nor my presentation style. If you simply write something such as "boring and uninspiring," you have successfully hurt my feelings and told me nothing of why you felt that way or how I could do better. Just the same, if you think something is "fantastic," I need to know why. Recently, my ten-year-old son has started presenting with me. 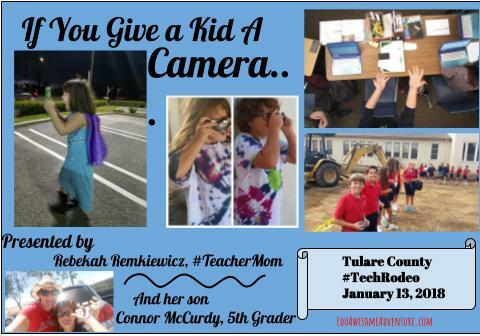 We developed "If you give a kid a camera" originally for a (future) conference that would target parents, home-school parents, and alternative educators (think independent study, for example). We based it on our experiences as the #EdTechFamily which include family experiences, lesson designs, projects he has created as a student, and student creations from my classes. When we presented this at the end of February, he was an official presenter with his own email correspondence from the event organizers. This meant that feedback would go to him too. Ladies and gentlemen, let me say again that the feedback you give goes to the presenters for review. This time, I was stunned. The email came through and mixed in with some great feedback and constructive criticism, I found some blunt, hurtful comments. The people in the room, I assume, are educators. Before you fill out those feedback forms, whether the presenter is 10 or 40 or 70, please stop and ask yourself if you would respond to a student the same way. Ask yourself if it is potentially helpful. I was able to filter what my son saw eventually and I am thankful for the help I had with that. That said, if you would not say it to a student, then probably you should rethink your phrasing. Allow me a moment to translate the "boring and uninspiring" example from above. "This session was not what I expected and I didn't get anything useful from it because..." "Next time, try to liven things up a little more." "The son needs some more practice, but good for him for stepping out and trying to present this." "I really would like to see more (such and such)..." See the difference? I subscribe to the EdCamp way of thinking. If you're in a session and it isn't working for you, then please feel free to go check out another session. Yes, I will notice that you're walking out the door, but I won't take it personally. If my session is different than you were expecting and you need something different, that's ok. I understand. Heck, I've been there. You need to get the most out of your conference and workshop experiences that you possibly can. Be kind and thoughtful in your feedback. Do what you need to do to maximize your conference experiences. And, please remember that your feedback can potentially help make a presentation better. Those of us who attend conferences as presenters do so to try to offer you something. We are educators, just like you. Some things work, some things do not. Tomorrow is a new day. As the big Spring CUE Conference approaches, I hope you will take some of what I have said here to heart. I hope you have a fabulous experience in Palm Springs! If you see me there, please say hi and, if you're so inclined, let's take a selfie. I don't have any sessions this year, but I will be presenting my "big idea" on Friday afternoon as a Leroy Finkel Fellowship finalist. Come on by and check it out if you don't have another session to attend at that time. I've been chanting this in my head this month. EdCamp! EdCamp! ETC! February has offered some fabulous learning experiences and excellent connection-building opportunities. The shortest month of the year has been packed full of awesomeness. It kicked off with EdCamp0203 in Sacramento, CapCUE hosted the all-day event that included lunch midday. The day was full of so many good sessions, I had a difficult time choosing what to attend. The first session of the day rocked. I enjoyed collaborating with other educators as we discussed video and audio recording. We shared podcasts we enjoy and tools we use. The biggest take-away for me came from a math session in the afternoon. I still have to revisit some of the resources and see how I can incorporate them into my math instruction effectively. This year I have set my sights on focusing my learning in areas of STEAM, especially math. 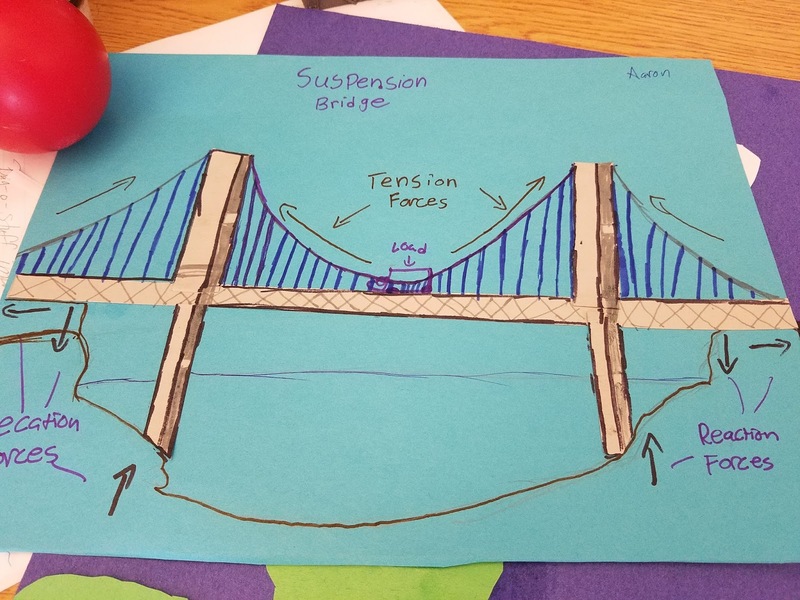 I have a goal of establishing a STEAM club and I am always interested in how to make my math instruction stronger with great engagement for my students. One day, I hope to get to a Bootstrap session, but that's a whole separate post for another time. The co-ordinators of EdCamp0203 did a really good job of providing collaborative resources using tools that teachers are using in their classrooms. Each session had a Padlet where we shared ideas, questions, and resources. There was a Flipgrid set up for the day where educators collaborated and shared as well. I haven't yet caught the "Flipgrid Fever" but seeing this particular application of it helped me see how it is something worth looking into more. It may be a toll I incorporate in the future, but for now I was happy to have it to use as part of my professional development. The second Saturday of the month landed me in San Jose for another EdCamp. This one lasted for about half a day. It started with bagels and coffee provided by Panera as educators gathered, wrote their ideas on sticky notes and the session board was built. For the first time, in what seems like ages, I saw Craig Yen who I first met through attending various EdCamp events. I missed seeing some of my favorite faces, but gave thanks for the location. Notre Dame High School provided a beautiful location that seems so full of campus life and a positive atmosphere. I took notice of inspiring notes on lockers and absorbed some of the various projects on display. Campus life appears to be strong and that helped make this smaller EdCamp event breathe a life of its own. Sessions were small and cozy with great ideas that developed through the day. Now two weeks out, I just closed the last of the Google Docs I had open from the day. We collaborated in Docs and emailed follow-ups from attendees kept the learning going. The big event of the month came just yesterday. Every year the Stanislaus County Office of Education puts on ETC! I have greatly enjoyed his day filled with education technology learning the past few years. This year I presented for the third year in row. I brought back "Technology as the Swiss Army Knife of Education" with some updates. Interestingly, as I presented, I found that it is time for some more significant updates and I will make them then propose this one again in the near future. The other session I did was "If You Give a Kid a Camera." The cool thing was it was more than "my session." My ten-year-old Connor joined me for the second time this year in presenting it. He adds something special to the whole thing. We have a version I present solo and another version we present together. This one rocked! I look forward to building it, updating it, and continuing to present it with him. 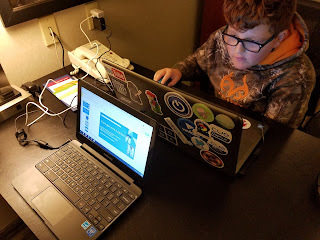 He and his sister have an idea for our EdTechFamily to present together in the future, too. I love that they love sharing ideas with educators and I hope educators are ready, willing, and able to listen. So far, so good. These kids bring such awesomeness to my life as a mom and as an educator and I enjoy seeing what they want to share with others. The thing that makes my sessions improve with time is really quite simple. Feedback. I LOVE constructive criticism. I LOVE hearing what works. It is with feedback that I can return to what I have presented and find ways to improve it, update it, and make it what educators need. In an EdCamp format, we spend our days collaborating constantly. We share what works, what doesn't, and the why of it all. We learn because we go in and know that the smartest "person" in the room is the room itself. We have a day f give and take. We go to learn, to share, and to grow. Of course, those are also reasons we attend conferences such as ETC! The format is what varies, naturally. So, as a presenter at conferences, I anxiously await feedback. I know that I can sense certain things and that provides me with my own self-reflection and subsequent changes to what I present. However, feedback from attendees is always a significant factor. I have received straight criticism and it hurt. I found myself digging into it, trying desperately to find something constructive in it to use. I have received written high-fives. It makes me feel good, but lacks something substantial to tell me why something worked. All of that is ok, but, of course, I prefer constructive criticism. Knowing this about myself, I have worked to be more diligent in filling out feedback forms following sessions. I know that every presenter needs feedback. I have found another form of feedback that works really well. A little over a year ago, I stumbled across the hashtag sticky notes at Dollar Tree. I instantly picked them up. And then I picked up some more. And some more. I saw them and I know that I needed them. The idea hit me instantly. "These are going with me to conferences!" I carry a couple of packs of them in my backpack. I keep them on hand for the end of sessions. It is perfect! 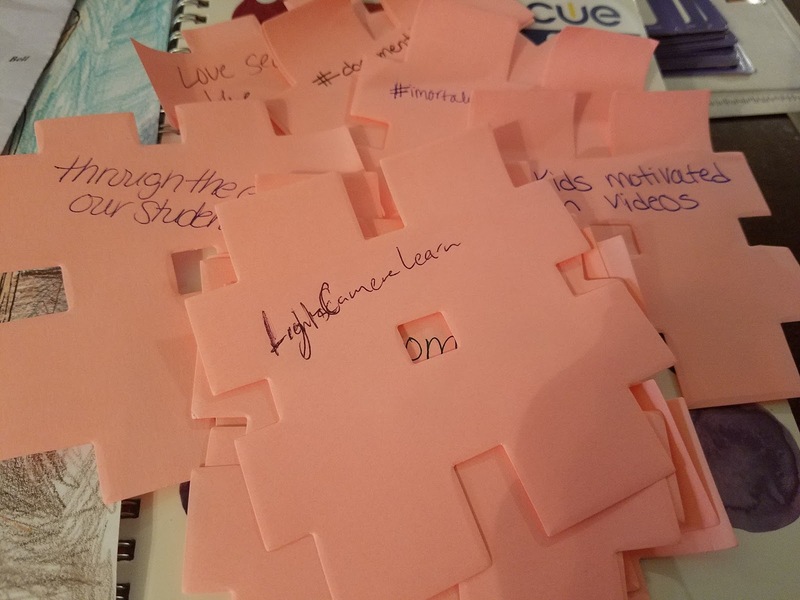 Pull out the sticky notes, walk around the room, and ask attendees to "Hashtag this session." Anyone active on social media will know exactly what you are asking of them. Summarize it. Tell people about it. Simply. The "hashtag this session" moments provide us with instant feedback. It also tells us what the big "take-aways" were. This may be the most constructive, to the point feedback you may receive. Sometimes I run out of time for this. and that's ok. The success or failure of my session does not ride on whether or not attendees have a chance to hashtag it for me. Connor and I added a slide to our "If You Give a Kid a Camera" session so when we get to the end, we can do this together. He hands out camera stickers while I hand out hashtag sticky notes. It works. Yesterday, it worked exceptionally well. A few folks walked out without doing it. One flat refused a hashtag. That's cool. We get it. Not everything works for everyone. But, we also received some fantastic feedback in the form of hashtags. And it gives us something real to hold in our hands, look over, and discuss afterwards. It helps us as we go back and look at what we shared, how we shared it, and how we will rework certain things. It helps us see what educators got from it and compare it to where we started when we designed the session. It's just a simple, quick, EduAwesome moment of our session time. EdCamps, conferences, and various professional development events all have their own hashtags. We develop hashtags for our sessions. It just makes good sense to have hashtags develop out of our sessions as well. I will eventually have to look at how to continue this after we run out of these great sticky notes, but the general idea is something I plan to hold onto for awhile and will use more in future sessions. How do you get feedback following presenting a session? What is your preferred format? Why? Also, as a session attendee, when and how do you prefer to offer feedback? ***Revisit how Hashtags Changed me Life. Bonus share: my quick video from awhile back about why I love EdCamps. A STEAM review. Students watched this video then wrote their thoughts on the this STEAM project. M.K The video showed the capabilities of the robot but did not show how the robot was put together or why the person who built the robot chose this project. B.C I want to know how it worked. E.C. I think this is interesting that a 7th grader could build and program this. A.C. I would recommend this video for someone who wants ideas of what to make for robotics project. V.K I want to know the resources for this project. M.E I would recommend this to people who want to just watch something interesting but it needs more facts like how does it work. E.E. The video is mesmerizing. N.M. I wonder if the robot works for every position. The Rubik's cube was put in there in a certain position, is it programmed for just that one placement or does it work for for any random one? 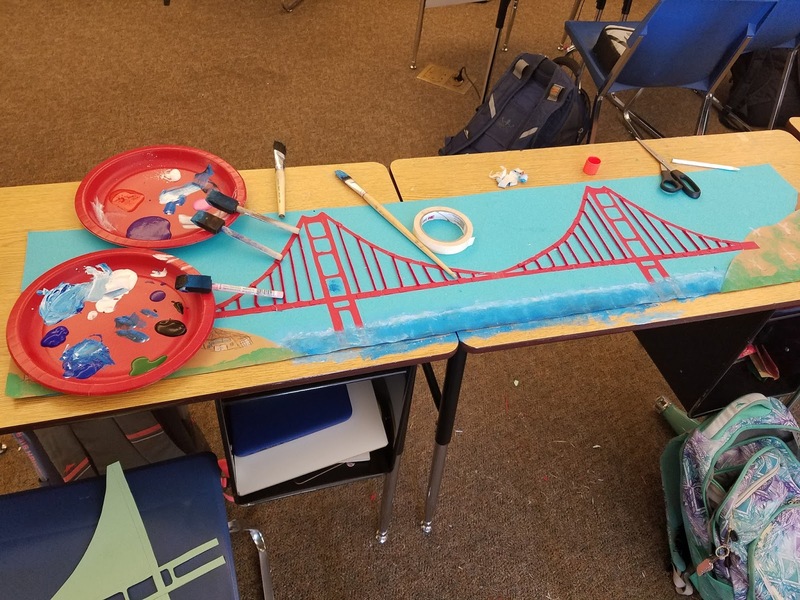 Many thanks to the fabulous middle school students who contributed to this blog post.